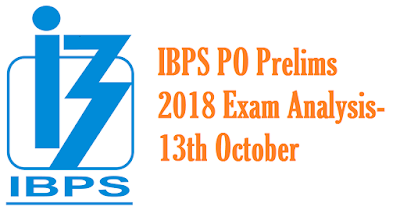 Dear Students, We are sharing detailed exam analysis of first shift of IBPS PO Prelims 2018 Online Examination conducted today(13th October 2018, Saturday) from 09am to 10am. Overall question paper of first shift was of moderate level. Quant was moderate and calculative. In English, RC was asked on News and Mass Media. In quant three sets of DI asked viz. Line Graph, Bar Graph and Tabular. Direct Inequality asked in Reasoning section. Floor Based, Liner and Rectangual Type Puzzles asked.